A recent article in The Courier Mail, based on the Nielsen 2010 Internet and Technology Report, found that Australian internet usage and time spent on the web continued to increase throughout 2009. Surprise, surprise! The average Australian now spends a total of two working days online every week! 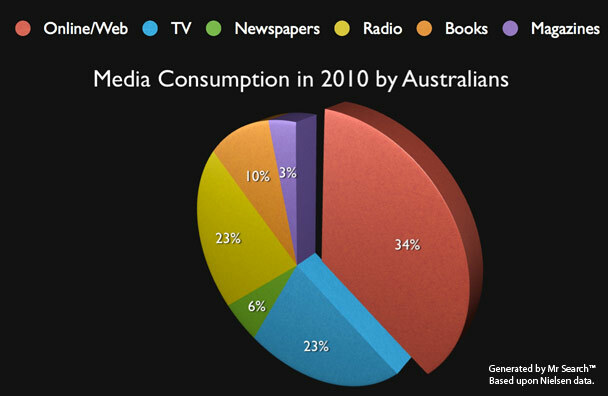 This is an increase of 9 percent from the 2009 results, and highlights just how important the internet has become to the every day Australian, as a research tool, for shopping, communication, and entertainment. Can customers who are already searching Google for services which you provide, find your website? Being found on the first page of Google Search results is imperative. Our Google Adwords experts are able to program, maintain and optimise a highly comprehensive Google AdWords campaign for your business, delivering guaranteed front page Google Exposure for all your important keywords. Get in contact today, for fast, professional service. Does your company website give prospective customers the best possible impression of your business? If you are serious about winning customers business, you need to ensure your website is as good, or better than all your competitors sites. Prospective customers make a judgement about your company, and whether they will stick around on your website within 5-10 seconds of arriving. It's crucial to send them a good first impression! Are you able to track what customers are doing on your website once they get there? Where did customers come from? Search engines? Referring websites? Yellow Pages? What marketing and advertising mediums are bringing through the largest amount of traffic? What times of the day are the busiest (in terms of website traffic)? Which search keywords are most effective at converting traffic into enquiries and business? You get the idea! Knowing this information is so important in making advertising and marketing decisions which will deliver highest return-on-investment for you. What web browsers and operating systems do your web visitors use? Does your website load correctly on all these platforms? No point taking traffic through to a seemingly dysfunctional website. AUSTRALIANS are spending more and more time online, with the average internet user investing more than two working days on the net every week. Generation Y is even more committed to the internet, spending almost a full day and night online each week, but Baby Boomers are jumping on board the trend too, spending almost as much time online as they do watching television. Details of Australia's love affair with the web were revealed today in Nielsen's 2010 Internet and Technology Report. The study of 2371 Australians showed internet use jumped nine per cent from last year, or an extra 90 minutes each week, and the average Australian internet user now spent 17.6 hours online every week, or 19.7 hours if they had broadband internet access. Men spent more time online than women, by an average of 3.1 hours, and those aged between 16 and 29 were the biggest internet users at 22 hours per week. But this extra time online did not stop Australians investing more minutes in other media, Nielsen online business managing director Matt Bruce said. Television viewing simultaneously increased 30 minutes to 13.4 hours per week on average, he said, as Australians engaged in "media multi-tasking" and used technology such as personal video recorders to control their media viewing. Australians also spent more time reading newspapers (3.2 hours), listening to radio (13.4 hours) and reading books (5.6 hours) each week, though they invested the same amount of time reading magazines and exercising as in the past year (2 and 5.2 hours respectively). The Nielsen report mirrors Australian Bureau of Statistics findings that more than five million households had broadband internet access in June 2009, an increase of 700,000 homes on June 2008. A further 900,000 Australian homes had basic internet access, the ABS found, out of a total of 6.4 million households with a computer.